The Ultimate in Knife Sharpening Systems Technology Safe, Easy and Convenient to Use. 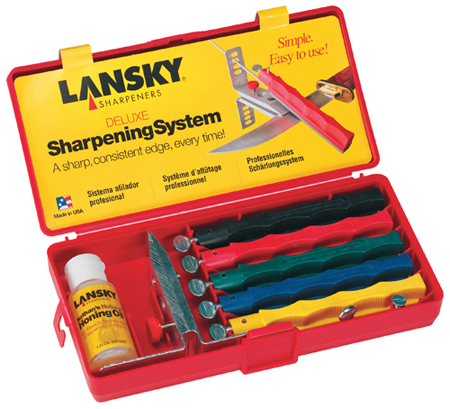 The Lansky Controlled Angle Sharpening System is designed to give your blade a professional, razor sharp edge every time. Includes Extra Coarse (70 grit), Coarse (120 grit), Medium (280 grit), Fine (600 grit) Alumina Oxide Hones and an Extra Fine Ceramic (1000 grit) Hone. Precision-engineered, multi-angle, flip-over knife clamp. Sharpening hones on color-coated, finger-grooved safety holders. One guide rod for each honing stone. Specially formulated honing oil. Custom molded storage/carrying case to hold all system components.